Despite their campaign promises, Miami Beach legislators are stepping up to the plate for the hotel industry to impede innovation and competition, this time going after homeowners that list their property on AirBnB to the tune of $1.6 million in fines. AirBnB is a popular service that allows anyone to list a room, bed, or even an entire building for a rate of their choice. Users looking for lodging can book them, just like a hotel, and the rates are almost always significantly cheaper than traditional lodging, with some estimates showing that Airbnb can be 21.2% – 49.5% cheaper than hotels, on average. The hotel and lodging industry thrives on a level and legal playing field and welcomes competition from the “sharing” economy. Competition in the lodging sector thrives when everyone plays by the same set of rules designed to ensure the safety of our guests and our communities. We support the rights of property owners to occasionally rent their homes to earn extra income. But we share the concerns local residents have expressed about the growing number of commercial operators who are using sites like Airbnb to run multi-unit, full-time lodging businesses without any oversight. Despite the current crop of Miami legislators being swept into office on platforms of supporting sharing-economy type services such as AirBnB, they are now cracking down on these ventures, taking the hotel industry’s side at the expense of consumers. Starting in March, the Miami government began fining short-term renters up to $20,000 each. Because it is also illegal to advertise short-term renting, Airbnb, Booking.com, and Homeaway.com have been hit with 18 fines. Why? The reason is simple: taxes. The hotel industry in Miami has to pay 13% of its revenue in taxes to Florida and the city/county government, which accounts for a massive amount of the city’s budget. If Airbnb played by the same rules, it would owe Florida and the city an estimated $15,947,783. A local law, ordinance, or regulation may not prohibit vacation rentals or regulate the duration or frequency of rental of vacation rentals. This paragraph does not apply to any local law, ordinance, or regulation adopted on or before June 1, 2011. 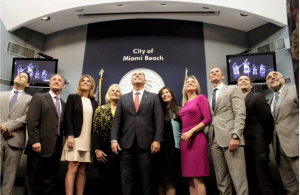 “They dramatically ratcheted things up when they did that in 2016,” said Ross Milroy, a luxury property broker in Miami Beach says, who adds “this needs a class-action lawsuit” to find out if the city’s new fees are actually permissible. “I think they pushed the envelope too far,” Milroy continued. For more information about the Libertarian Party of Miami-Dade County’s efforts to fight against this overbearing regulation, check out their website at this link. Content created by the Stonegait Institute is available without charge to any eligible publisher that can provide a substantial audience. For licensing opportunities of our original content, please contact Joe@StonegaitInstitute.org. Click on this link to support the Institute’s efforts.